Guys shouldn't wear skirts like women shouldn't wear baggy pants. Utilikilts are popular amongst certain niche circles (mostly those who frequent renaissance festivals and Comicon-style events). I've seen two men wearing skirts in the last couple of years, and both were skanks. Even if I was in the market for a new relationship they would not make my D list. Men will wear what women want to take off them. Historically, men have worn togas, kilts, sarongs, robes, tunics, etc., so it's not inconceivable that some men might don skirts. I doubt it would be widespread. Simple question. 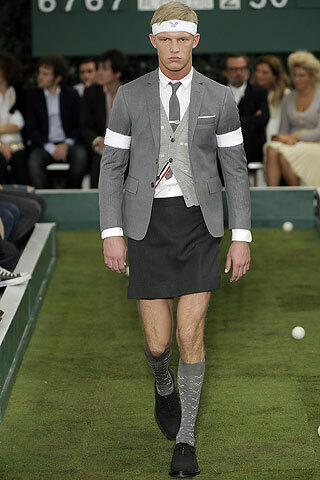 Will menswear evolve to include skirts in the same vein as womenswear did to include pants? I don't see this taking off anytime soon. As a woman, I often prefer skirts/dresses to pants in warmer weather for coolness factors. But I was talking to my SO's brother-in-law, who is Scottish, the other day, and he wore a traditional kilt for his wedding. And as traditional tartan kilts have something like nine yards of fabric, layered, and made of wool (all the better for keeping warm in the highlands, traditionally), keeping cool is actually NOT a feature.